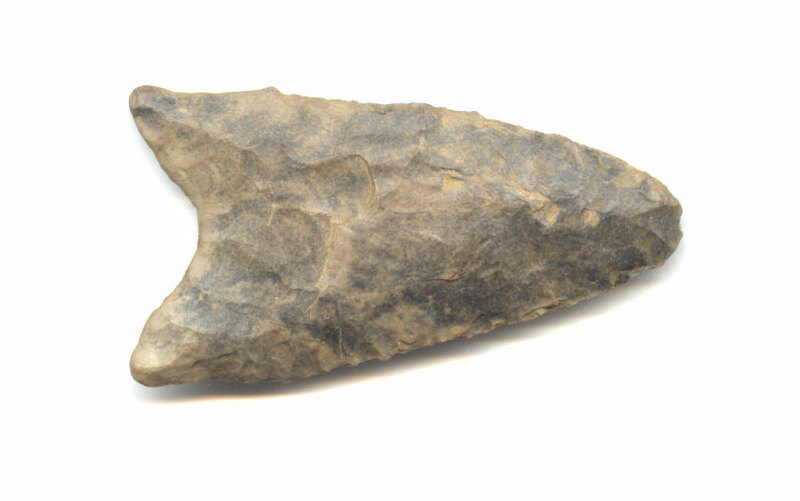 A Small Size, Heavily Patinated And Visibly Aged, Basal Thinned Dalton Point That Exhibits Surface Frosting Aging And Stone Patination, Deep Aged Stained Hinge Deposits, Correct Basal Thinning, Correct Style Base And Overall Shape, Consistent Aged Surface Deposits, Correct Early Style Blade Flaking, Polished River And/Or Use Wear, Correct Material And Manufacture For The Area Found. Found On The Fourche La Fave River, Near The Town Of Rover, Arkansas In Yell County. Ancient Repeated Sharpening Use Has Reduced The Blade Length And Width Resulting In A Rounded End Use Tip. Includes A Ken Partain Certificate Of Authenticity.